Blogging has slipped by the wayside recently due to buying a flat and starting a new job. But I’m back! I had a lot of requests from Instagram and Twitter followers to blog some photos of our gorgeous Tyneside flat, so I though I’d start with something small as the flat is no where near done yet and I want to show it off properly when we have it pristine. I always knew I wanted beautiful and unique prints up around the flat, and started buying some of my favourites before we even got the keys. Coincidentally, all of the prints below are by North-East based design studios – we have so many talented designers here and I love supporting them. Here’s a quick look at some of the prints we have up around the flat – I’ve got a lot which are waiting to be framed, so will snap them when they’re ready to go up. My absolute favourite print, Always in England, sits above the fireplace in the master bedroom and is by the brilliant Prefab 77. I’m still longing for one of their amazing Let It Reign prints – the ultimate way to commemorate the Diamond Jubilee. In LOVE. 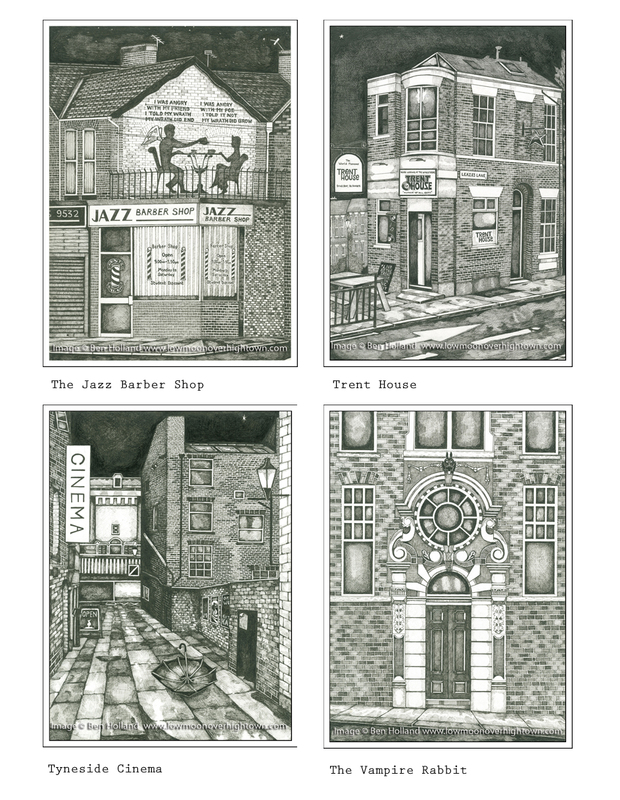 Ben Holland who goes under the alias of Low Moon Over High Town, creates amazing ink drawings which celebrate less revered architectural gems located in the North-East. The above print is of the Crown Posada, one of Newcastle’s oldest pubs and one of mine and Joe’s favourite places to have a drink in the Toon. The Crown Posada have the best record player and a cosy snug, the perfect place for a quiet drink on date night. Next on my list is Ben’s Vampire Rabbit print. Above (L-R) are prints by WonderStuff Studio and C-Front, both North East based design studios. I love the hidden message in WSS’s eye chart print (If You Know Where To Look, You Will Find Happiness) and C-Front’s Impossible Love print is a brilliant piece of design. I heart it. Love the tiles in your hallway! Thanks for the lovely comments about The Happiness Test print. Wonder Stuff Studio.